The AOS released the third batch of taxonomic proposals for 2017 (pdf). Highlights include splits of the Nashville Warbler and Brown Creeper and a lump of Thayer's and Iceland Gulls. See also discussion at the ABA Blog. If Nashville Warbler is split, I hope the eastern population gets a better name than "Rusty-capped Warbler" since the reddish spot is one of the bird's least-visible features. Satellite imagery shows migratory shorebird habitat loss in California's Sacramento Valley because of drought and reduced seasonal flooding. Landscaping with native plants is better for birds since birds feed their young with the insects that are adapted to native plants. 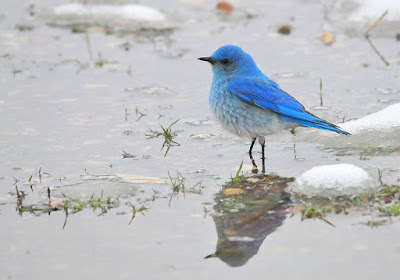 Birds are able to stand on ice without freezing because of a heat exchange that warms blood as it returns from their feet and because their feet have fewer nerves and muscles to get frostbite. The US Fish and Wildlife Service is running a live web cam at a Greater Sage-Grouse lek in Oregon. While the web cam runs all day, viewers are most likely to see grouse activity during the early morning hours (presumably Pacific time). Look for migrating Turkey Vultures as they return to points further north. Birds have blind spots in front of their heads, and the size of the blind spot seems related to beak size. Feathered Photography: Can’t We Go Any Faster, Dad? The Trump administration issued an executive order this week to start a rollback of various Obama administration climate initiative, including the Clean Power Plan. Issuing new regulations that can pass legal challenges could take some time. A White House official who briefed reporters on the order appeared confused about climate science. The ending of federal leadership on climate change means that cities and states will have to retake the lead. Scott Pruitt rejected the conclusions of EPA scientists and decided not to ban the pesticide chlorpyrifos. The pesticide poses a threat to people, especially children exposed to it, and also to 100 species of birds. While the Trump administration gave its approval for the Keystone XL pipeline, construction still faces legal hurdles and likely protests. Meanwhile, demonstrators in Indonesia are fighting the planned construction of a coal plant in Batang. Sweden, Germany, and France so far are the only EU countries fulfilling their Paris climate goals; most others have left loopholes in their new greenhouse gas policies. Climate change is already affecting the ranges of many plant and animal species, and that will likely include invasive plants. Climate change may be intensifying China’s smog problem because of climate-induced changes in weather patterns. Logging to stop the spread of invasive Southern Pine Beetles in Connecticut will have the creation of young forest habitat as a side effect. The West Indian Manatee has been downlisted from endangered to threatened on the basis of population stabilization and habitat improvements. A state appeals court ruled that Lacey Township can build a road on its section of the Barnegat Branch rail trail since the township never designated the former rail line as preserved open space. The Cheerios seed giveaway was well intentioned but could have been better designed. Keas have a warble-like call that encourages other Keas to play, which may be how their social system is maintained. Endangered Crested Ibises join flocks of Little Egrets while foraging probably because the egrets can identify potential threats more quickly. USDA Wildlife Services killed 2.7 million animals in 2016, including 826,000 Red-winged Blackbirds and 12,000 cormorants. About 1 million of the total were non-native or invasive species, but many rare or endangered animals get caught in the slaughter (usually accidentally but not always). Conservationists are looking for volunteers to teach captive-raised Hawaiian Crows predator avoidance tricks before they are released to the wild. A new paper suggests using more sophisticated statistical models to evaluate bird population trends. Early-season grazing leads to sage-grouse population declines, but grazing later in the season may be benign. 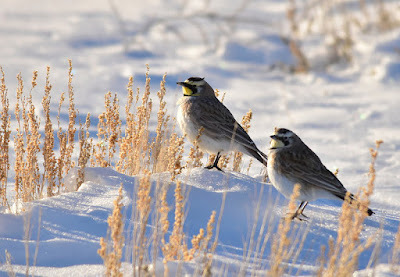 Conditions on a bird's wintering grounds influence its breeding success for some species like Savannah Sparrows. Warmer conditions are generally better but not if with combined with severe storms. A study using GPS monitoring devices found that some nonbreeding ravens stay around a single location while others travel widely in groups. A Night Parrot was photographed recently in Western Australia, the first sighting reported there in over a century. The species was thought to be extinct until its rediscovery in Queensland a few years ago. Chandler Robbins, the ornithologist who founded the Breeding Bird Survey, died this week. Here is a list of bird photography best practices. NY Harbor Nature: You See a Sick Seal on the Beach – What do you do? Congress voted to revoke an Obama administration rule and allow big-game hunting in national wildlife refuges in Alaska. New research explores the life cycle of venomous Lonomia moths. While the fate of the EPA hangs in the balance, it is worth remembering what things looked like when it was founded. The endangered listing for the Rusty-patched Bumblebee finally went into effect this week. Cheerios recently started a promotion of "bee-friendly" seed packets; unfortunately the packets contain seeds for plants that are considered invasive in parts of the U.S. Here are some suggestions for better ways to help bees. Sediment samples from a 22-mile stretch of the Hackensack River found a broad array of contaminants. Samples showed particularly high levels of mercury, including a reading of 760 ppm in a tributary near MetLife Stadium. The EPA is evaluating whether the river should be added to the Superfund program. A tree survey in San Francisco recorded about 125,000 street trees from 628 species. A tree map for San Francisco can be viewed here. Many New Jersey counties remain under a drought warning despite the late winter snowfall. Over the past several decades Peregrine Falcons have returned from near-extinction to rule urban landscapes, where they nest on skyscrapers and bridges. Birds with flexible nesting requirements can thrive in the suburbs (sometimes increasing bird diversity there), but ones with more specific requirements have to look elsewhere when a place is developed. Early spring is a good time to look for migrating waterbirds. Male Common Cuckoos can distinguish the calls of their neighbors from those of strangers. When food is plentiful, adult Galapagos Penguins continue to feed their young after they fledge. Poachers on Cyprus killed 2.3 million birds during fall migration in 2016. A British military base was the site of 800,000 of the killings. 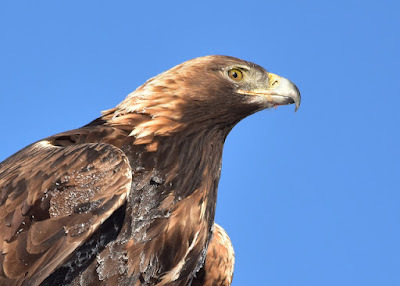 Bald Eagles and other raptors are at risk from lead poisoning from spent ammunition. The proposed federal budget would cease funding the cleanup of the Great Lakes, which has helped bird populations recover in the region. 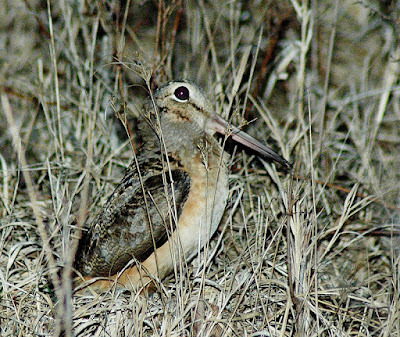 The Prairie Ecologist: Should We Manage for Rare Species or Species Diversity? The first climate model was published in 1967, and its major prediction, that doubling the amount of carbon dioxide in the atmosphere would result in 2°C of warming, has held up in the 50 years since then. It remains to be seen what Zinke's Interior Department will look like and how conflicts among his stated priorities will be resolved. Two bills that claim to promote transparency at the EPA would actually hamstring the agency. Loss of milkweed habitat to agriculture may not be the only problem affecting Monarch butterflies; a lack of nectar plants during fall migration could also be causing declines. Spiders eat 400-800 million tons of prey each year, most of which are insects but also includes small vertebrates like fish. The new Stone Leaf-litter Frog was discovered in northern Vietnam. Kingsnakes are notable for applying much more pressure to their prey (including other snakes) than most snakes do. A British butterfly collector was charged with killing several specimens of Britain's rarest butterfly, the endangered Large Blue. A wolf family is missing in California. NJ DEP adds wooden barriers around four ponds in Wharton State Forest to block ATVs from driving through them. 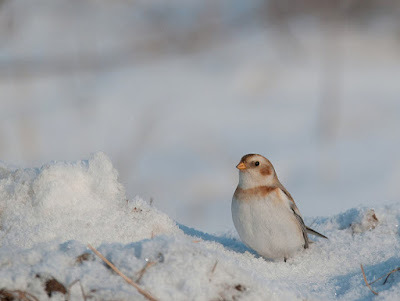 An ornithologist proposes a new way to understand species boundaries based on the compatibility of nuclear and mitochondrial DNA; he gives a fuller explanation for non-specialists in an AOS author blog post. The NY Times reviews recent research into the breeding behavior of Blue-footed Boobies. A study using geolocators mapped the migration route of Kirtland’s Warblers from their breeding grounds to the Bahamas and back. Guillemot chicks jump from their clifftop nests to the sea before they can fly, possibly to be closer to food resources. Growth of new trees in Guam's forests has declined considerably since introduction of brown treesnakes, which wiped out the birds that spread seeds over the island. Acorn Woodpeckers have smaller brains than one would expect for a social animal. Scott Pruitt, the incoming EPA administrator, affirmed his commitment to climate change denial this week by staffing the agency with Senator Inhofe's disciples and denying that carbon dioxide emissions are causing climate change. The administration's proposed budget includes steep cuts for the EPA and for NOAA's climate science programs. The budget would also cut the cleanup program for the Chesapeake Bay by 93%. Meanwhile, Congress killed BLM’s Planning 2.0 rule, which will seriously set back how BLM makes planning decisions for public lands. This winter was much warmer than usual in much of the U.S. Many tree species in the eastern US, especially ones in northern forests, may be unable to adapt to a warming climate. For forests to play a significant role in meeting carbon emissions reduction targets, we need a more transparent way of measuring emissions internationally. As birders and conservationists predicted, the new, glass-covered stadium for the Minnesota Vikings is killing birds at an astounding rate. Here is Audubon's report on the fall 2016 season (pdf). The Greater Prairie-Chicken population in Illinois needs human intervention because of declining genetic diversity and loss of habitat. A profile of Noah Strycker muses on what gets people into birdwatching. A California photographer has recorded a roadrunner catching a hummingbird in midair. Another video shows turkeys circling a dead cat in the middle of a street, possibly a form of predator defense. Volunteers are helping the effort to rebuild the endangered Orange-fronted Parakeet's population in New Zealand. An albino Black Vulture was found in New York. Last year a record 172 Bald Eagle pairs with 216 chicks were recorded breeding in New Jersey. The companies responsible for the Berkeley Pit in Montana will start using propane cannons and lasers to scare waterfowl away to prevent more incidents like the deaths of several thousand Snow Geese in November. Corvid Research: Have you ever seen a caramel crow? Splendour Awaits: Photographs as specimens: Adding value. Today is UN World Wildlife Day, which celebrates the signing of the Convention on International Trade in Endangered Species of Wild Fauna and Flora (CITES). For more, see the linked website or follow the #WorldWildlifeDay hashtag on Twitter. The proposed federal budget would cut EPA staff from 15,000 to 12,000 and reduce or eliminate funding for environmental justice and energy efficiency programs. Rep. Ryan Zinke was confirmed this week as Secretary of the Interior, the department that oversees most public lands, including national parks and wildlife refuges, and is charged with enforcing the Endangered Species Act. His nomination caused a split among environmental groups, with many opposing but some supporting. One of Zinke's first acts in office was to revoke the Obama administration's rule (pdf) against the use of lead ammunition in national wildlife refuges. Lead poisoning from ingesting ammunition is a major cause of death for many species, including endangered California Condors. The Trump administration also wants to reverse the Obama administration's Waters of the U.S. rule, which had sought to clarify which waterways and wetlands are regulated under the Clean Water Act. Budget cuts to state parks pose a major conservation challenge, especially in Wisconsin where tax-funded support for parks was eliminated. If the proposed border wall is constructed along the entire border, it would have substantial effects on wildlife and natural landscapes (in addition to the human rights problems). Forest degradation (especially in the tropics) is a major source of greenhouse gas emissions but tends to be overlooked in policy-making. Drastic cooling in the North Atlantic could happen sooner than expected due to slowing of ocean currents. The warm temperatures in the eastern U.S. have pushed salamanders to start migrating to their breeding grounds earlier than usual; in many places, like the Delaware Water Gap and East Brunswick, roads are closed temporarily on migration nights. The Pinelands Preservation Alliance is starting a campaign to protect the waters of the Kirkwood-Cohansey Aquifer, which are increasingly threatened by development projects (like the Pinelands pipeline). A bill in New Jersey's state senate would ban logging within the Highlands protected area.